Whatever your cause, fundraising is challenging. Bring all your disparate processes, communications, and donor data into one single application and make work less stressful. Reach out to the right people, raise more funds, and increase the impact of your campaigns. 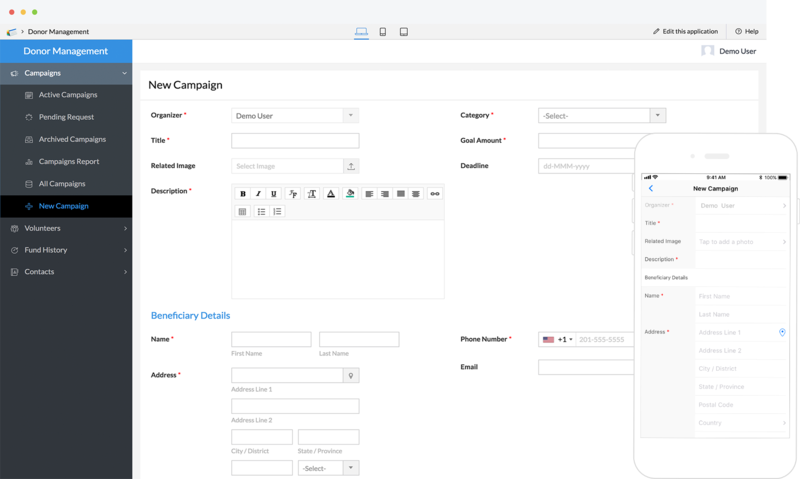 All-in-one platform to communicate, track, and manage your fundraising campaigns. Add and manage multiple campaigns with different purposes and goal amounts from a single place. You can schedule your campaigns, set a goal amount and define the purpose of the campaign. Also, regularly monitor the progress of your fundraisers with customized reports. Engage and retain existing donors. Maintain individual donor profiles and access their information instantly. Get a deeper understanding of your donor base, so that you can rightly engage with them and motivate them to support you in your mission. Make the most out of your volunteer network. If there's anyone who can speak about your cause as deeply as you can, it’s your volunteers. Get more volunteers on board and encourage them to share your campaigns within their network to maximize the reach of your fundraisers. Get updates in real-time reports. 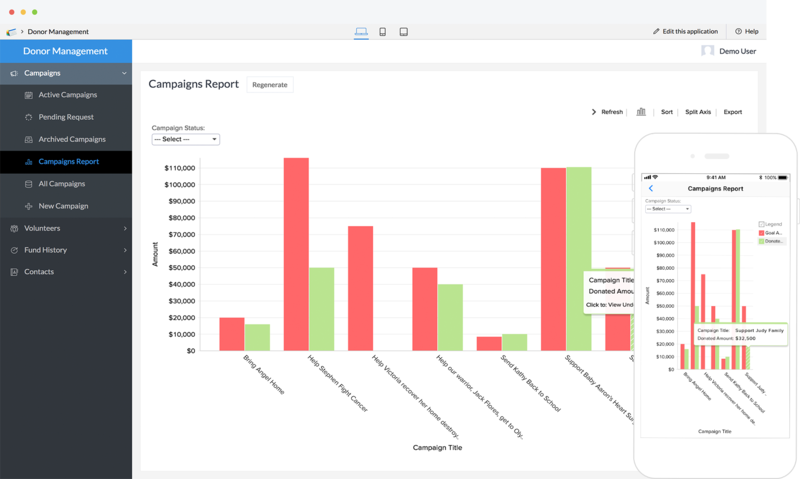 Use interactive reports and dashboards to constantly monitor and evaluate your fundraising campaigns, so that you can plan your future efforts. Use suggested filters and search options to quickly find what you need in just a few clicks. Automate and personalize your communications. 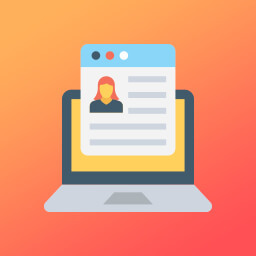 Segment your contact list into volunteers, members, and donors. Automatically trigger campaign announcements to volunteers and acknowledgment emails to donors when they contribute or refer someone. Customize pages to match your campaigns. Create and customize fundraising pages to effectively engage with your audience. Along with the donation form, you can include your brand logo, campaign-related images, and define the goal of your campaign in just a few clicks. You can even publish this page across all online channels. 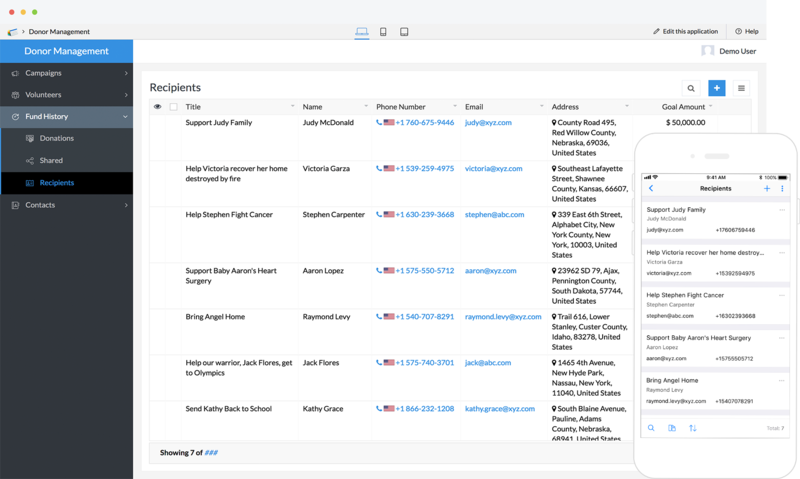 Link your donor app with other important systems of your organizations and streamline the entire fundraising process from campaign initiation to campaign success. With Zoho Creator's drag-and-drop workflow builder, you can add new features or tweak existing workflows even after you launch your apps. You can add task management module to your app that would help campaign supervisors to assign tasks to volunteer and track their progress. Monitor your campaigns on the go. Create donation forms that fit every screen size and make online donations possible from any device. Track your campaigns and instantly send updates about the progress to your donors, members, and volunteers.